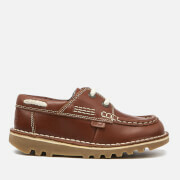 Kids' lace up shoes from Kickers with premium leather uppers and trademark rubber soles. Inspired by the classic 'Kick Hi' boot, the 'Kick Lo' shoes feature a rounded toe, four eyelet lace up fastening and a padded collar for comfort. Complete with triple-stitch detailing and iconic green and red flag branding.